As an engineer I find paddling not only fun, but technically fascinating. Spending hours at a time on the ergometer in Winter, and on water when it’s not frozen, has given me time to ponder why canoes do what they do… and to contemplate why I’m so slow. (But that’s another story.) This blog is a collection of articles on the science underlying paddling, where we consider topics of (hopefully) general interest in paddling physics, exercise physiology, and materials technology. The articles are written for a general audience that would be comfortable reading Scientific American. And I write them because it’s fun. In case you’re curious: I’m an avid paddler, having first explored the sport as a wilderness canoe tripper. 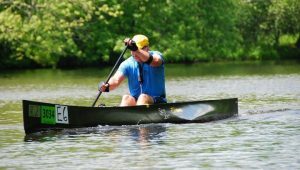 I’m a dedicated canoe racing middle-of-the-packer, and have been known to pole canoes, run spring whitewater, compete in canoe orienteering, and make paddles. I’ve been an instructor at the annual Maine Canoe Symposium since 1997. When I’m not paddling I work as an engineering and intellectual property consultant. I’m an inventor and patent holder of technologies for monitoring sports performance, with 10 issued patents and approximately 50 conference and journal publications. I hold a BSE in aerospace and mechanical engineering from Princeton University, and an MS and PhD in mechanical engineering from the Massachusetts Institute of Technology with a minor in applied mathematics. I’ve worked, studied, and conducted research in acoustics, fluid mechanics, embedded systems, wireless sensing, biophotonics, and feedback control systems.